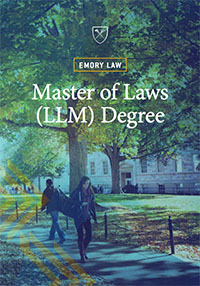 The Emory Law SJD degree program is designed for those seeking careers as teachers and scholars of the law. It is a highly selective program open only to applicants who possess a distinguished academic record in law, show promise of outstanding scholarship, and demonstrate potential for completing a scholarly dissertation of high quality. Students in the SJD program should be prepared to read and discuss in class difficult technical material. Foreign SJD students are examined and graded separately from the JD students in their classes. Daily class preparation is demanding. Students with English language limitations may have difficulty. Only students who feel confident in their English language ability should apply. For this reason, the TOEFL (Test of English as a Foreign Language) is required of foreign applicants seeking admission from nations in which English is not the primary language of instruction. A TOEFL score of 600 on the paper-based test, 100 on the Internet-based test, or 250 on the computer-based test is expected. Emory Law also accepts scores from the IELTS examination; a minimum score of 7.0 is expected. Contact Rhani Lott, Assistant Director of Admission.